Lynne's puppy image is adorable but I chose to focus on the flowers, and capture his beige colour in my kraft card base. I used new Simon Says Stamp products - Centre Cut Flowers and the Happy Birthday Script die. The flowers come as a 6x6 flower frame with a flower arrangement in the centre that can be stamped all together, or removed and stamped separately. I focused on the centre arrangement. I used the centre portion of the flowers and stamped them in the centre of my panel. I then created a mask for that arrangement and stamped it again on each side. I then used Copics to colour the original centre portion plus a few more on each side, leaving the flowers on the edges uncoloured. 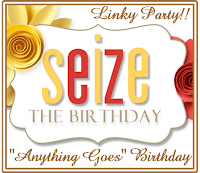 I'm also linking up to the Anything Goes challenge at Seize the Birthday. Gorgeous...I was thinking about using that stamp...it's so awkwardly large for an A2 card...but I love the center. And now a great idea from you on dealing with the size. Fabulous stamp use, great design and lovely coloring. Stunning card Ardyth - and great use of the stamp, masking and colouring. 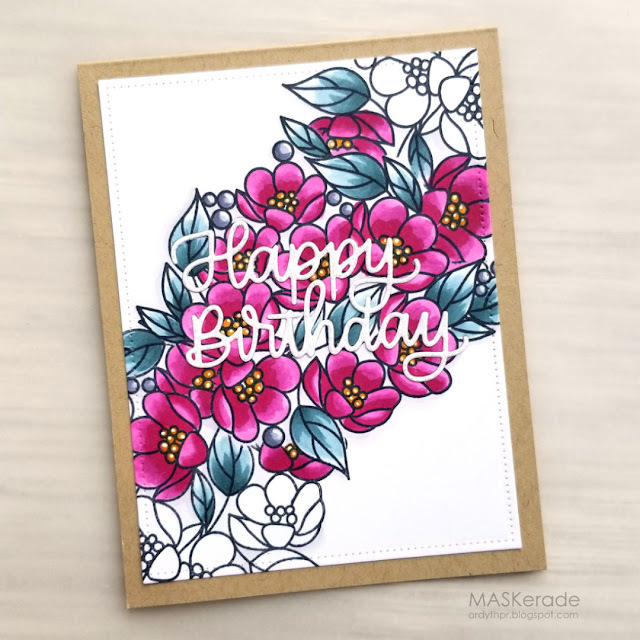 Love your big and bold flower that covers the card and how you only colored some of it...Fabulous! Thank you for joining us at Seize the Birthday! Gorgeous card and really beautiful Copic coloring, Ardyth! Love the design and colouring of this Ardyth. Stunning.